I have seen many sunsets, some more crazy than others, and thought I would by now have at least a slight chance to predict how a sunset would look before it happens. 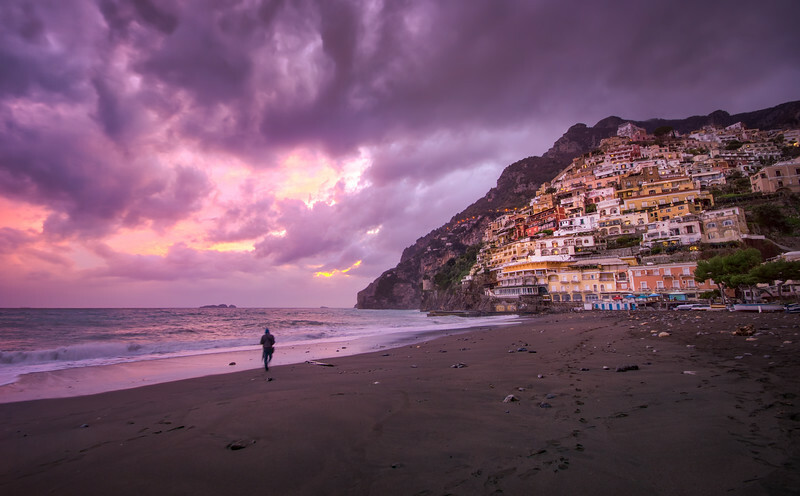 Well, Positano in Italy had me for a surprise! The clouds were grey, it was super windy and the waves rolled into the beach as if they were trying to get people to get the hell away. This was also the reason that the beach was nearly empty by the time it happened - within less than a minute, everything turned from grey to an unbelievably strong purple. I was so surprised that I did not even know what to do for a second - such unseen light and the whole area just for me! However, I knew that something that comes so fast will not last long, so I guessed I had about 5 min to go where I need to go and take the shot. And so I did. After 5 min, the party was over - the sky returned to grey and it became dark as if nothing ever happened. Such moments are exactly what drives me - the shivers, the running, the hoping... Wonderous times.